Easter is fast approaching, and with it comes the wonder of spring and new life. For the Easter holiday, baskets, bunnies, candy, games, and other fun things help make the day special and unique for children. This year, there are lots of ways for you to help make the day extra special for your little ones. 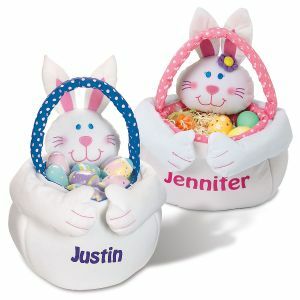 Easter baskets are not “one size fits all” for every boy and girl, and you can make sure your child knows which basket is for him or her by putting their name on it with a personalized Easter basket, bucket or tote. Once you have the perfect container it’s time to stuff it with Easter goodies for your precious little one. Easter baskets are as individual as the person receiving them, so the options for what goes inside are unlimited. Perhaps you have a little girl who’s all about being a princess. Her special basket can filled with a pink and white personalized Easter bunny sporting her own tiara, costume jewelry for your little princess to adorn herself with on Easter Sunday morning, and a set of nail polish that changes color. 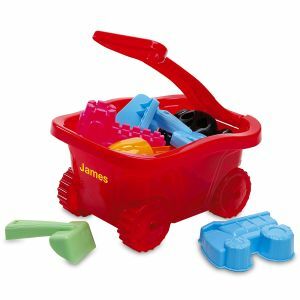 For the little mechanic or future aviator in your life, a bucket full of mini cars and trucks, transformers, and a model airplane kit or remote control helicopter will have him hopping up and down like the Easter bunny on Sunday morning as he unveils all the treasures you placed in a personalized Easter wagon or basket just for him. When it comes to candy treats, think gummy worms and edible slime. Do you have a reader in your household? Add some books on his or her favorite subject to the Eater basket booty pile. Is there a sports enthusiast in your midst? A new baseball glove, soccer ball, or running shoes is a great way to gear up for the coming season. Maybe you have a music lover in the house? A pair of concert tickets work for an older child, while a youngster might just do backflips over a ukulele or a coupon for music lessons. Are you raising a budding artist? A set of watercolors, drawing pencils, paints and brushes and sketchbook can be part of their Easter presents. A journal and set of colored gel pens are perfect for the next great novelist under your roof. If your child likes to help you in the kitchen, a personalized apron, set of measuring cups, and a simple cookbook could be just the thing for your little chef. For the future architect, a set of building of building blocks can spark his or her imagination for all the structural sensations they can create. The possibilities are endless for customizing this year’s Easter goodies when you tailor the basket contents to your child’s specific areas of interest. If you’re holding your own private egg hunt, try assigning specific colors to each child so that there’s no fighting over which egg is for which child. Make sure you have equal amounts of each color egg because most kids will compare their piles to see who got the most eggs! Make a few special eggs with geometric designs, gold or silver sparkles, or neon colors for any child to find. Whatever you fill your Easter baskets with this year, make finding them an adventure by leaving a trail of bunny footprints around the house that lead to the baskets and be prepared for squeals of delight when your children discover where their baskets are hidden. Whatever you do to celebrate Easter this year, enjoy the time with your family and making those special memories that last a lifetime.